Sirius is the brightest star in the night sky. It shines in the constellation of Canis Major and is visible from most everywhere in the Northern Hemisphere during the winter months. 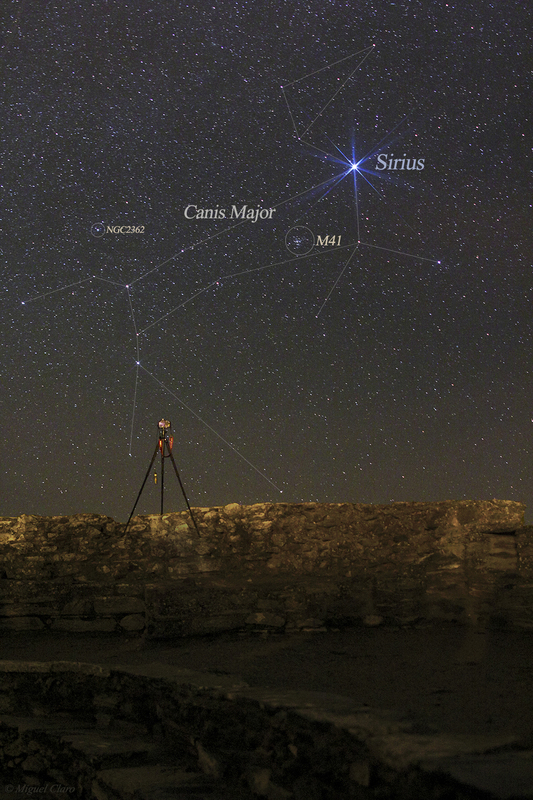 In the Southern Hemisphere, Sirius is visible from all locations during their summer, north of the Antarctic Circle. Approximately 8.6 light years away from the Sun, Sirius is one of the nearest stars. Its brilliance is both a result of its intrinsic brightness and its proximity. Sirius would seem to be among the easiest visible targets for telescopic astronomy, but a very bright magnitude of -1.46 makes it rather difficult to image properly – processing its data requires a good deal of finesse. However, Noel Carboni managed to tame scorching Sirius very well as you can see in this exquisite image, acquired on January 1, 2013. Moreover, all the faint stars in the vicinity of Sirius have been brought out by Noel's processing. Image details: Imaged using the mini-WASP array; 2-frames; 3.3 x 3.4 degree field of view.